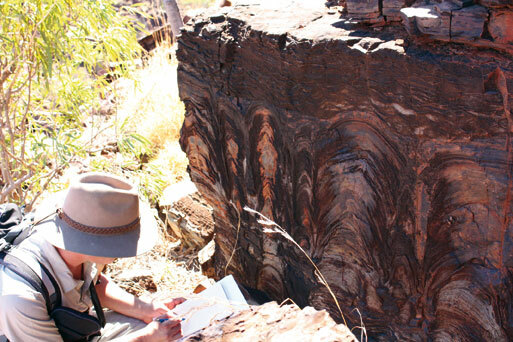 The fossilised stromatolites of the Pilbara region are among the oldest evidence for life we know. Now it appears some are even older than first thought, possibly pushing back the date at which oxygen-forming species appeared by 270 million years. Between 2.45 and 2.32 billion years ago the Earth experienced the Great Oxidation Event, in which the atmosphere first gained a high oxygen content. While this is accepted, there is much debate about what happened earlier. Under one theory, oxygenic life existed for a long time before the event, but methane-producing bacteria and re­active elements in rocks prevented the widespread oxidising of the atmosphere. Evidence for this theory exists in the oxygen detected in Hammersley Basin rocks formed 50–100 million years before the Great Oxidation Event (AS, Nov/Dec 2007, p.13). However, other theories hold that oxygen-producing life first appeared shortly before the oxidation of the atmosphere. Now PhD student David Flannery of the Australian Centre for Astrobiology (ACA) has found evidence that may shift the debate decisively. The fossils he found look very much like the stromatolites that survive today at Shark Bay, which were formed from oxygen-producing blue-green algae. Walter thinks it is possible that oxygen levels fluctuated for up to 500 million years as different species gained and lost the upper hand before oxygen producers finally became dominant. Scientists from the ACA are looking in the same rocks for microfossils that might shed light on the nature of the organisms. Others are investigating the genomes of modern bacteria and trying to use the DNA and RNA to work out when organic chemistry evolved.